Retailers should expect a robust holiday shopping season this year as the economy awakens, says University of Central Florida economist Sean Snaith in his latest U.S. Economic Forecast. The third quarter forecast produced by the UCF Institute for Economic Competitiveness expects stronger economic growth and higher inflation from the current administration’s policies will prompt the Federal Reserve to increase interest rates at a faster pace over the next three years. Federal funds rates are expected to hit 4.25 percent by the end of the third quarter of 2021. Real gross domestic product growth is forecast to accelerate to 3.1 percent in 2018, and then rise to 4.2 percent in 2019, before easing to 3 percent in 2020 and 2.2 percent in 2021. Snaith says payroll job growth over the next two years will be the strongest that can be expected for an economic recovery in its 10th year. Payroll job growth of 1.6 percent is expected in 2018 before rising to 2 percent in 2019. It is expected to ease to 1.7 percent in 2020 and to 0.8 percent in 2021. The housing market continues to recover and should slowly improve through 2021 in the face of rising mortgage rates. Housing starts are expected to rise from 1.32 million in 2018 to 1.68 million in 2021. 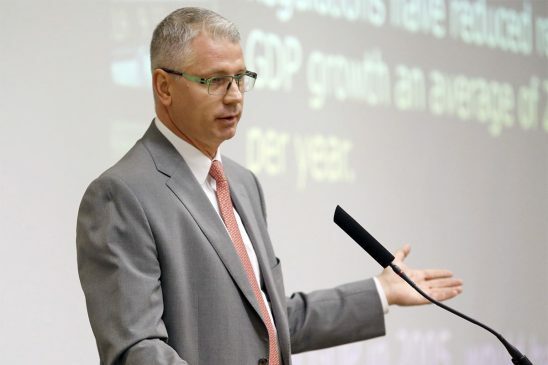 The headline unemployment rate is expected to decline to 3.2 percent in early 2020, and job growth should keep up with labor force growth through the end of the forecast horizon, Snaith said. “The economy is closing in on full employment and the faster wage growth that will indicate it has arrived,” Snaith says. In addition to being a self-proclaimed burger aficionado, Sean Snaith is a national expert in economics, forecasting, market sizing and economic analysis who authors quarterly reports about the state of the economy. Bloomberg News has named Snaith as one of the country’s most accurate forecasters for his predictions about the Federal Reserve’s benchmark interest rate, the Federal Funds rate. Snaith is featured in the recent episode of the new podcast Is This Really a Thing? – which is hosted by College of Business Dean Paul Jarley. The Institute for Economic Competitiveness strives to deliver complete, accurate and timely national, state and regional forecasts and economic analyses.